Haley Libs (4) celebrates after a Norse point during the game against Green Bay. NKU women’s volleyball team finished off their regular season play with back-to-back wins against Oakland University and Cleveland State on Friday and Saturday night. 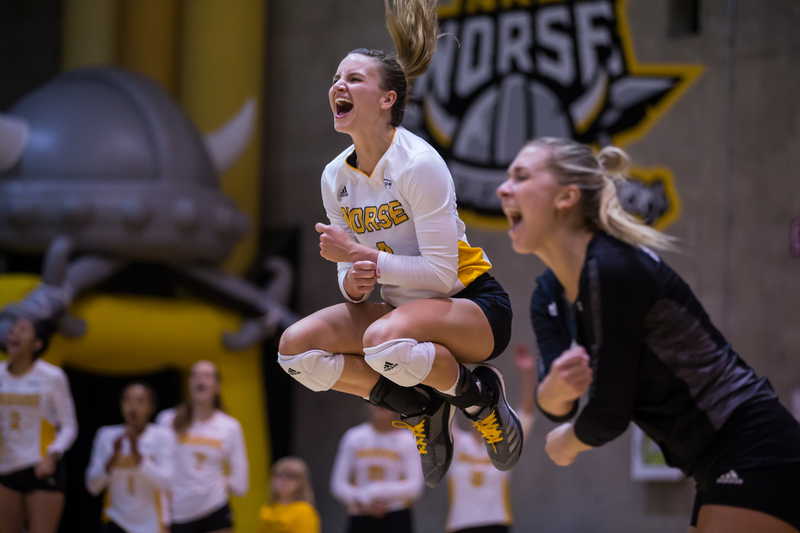 With the victories, the Norse recorded their highest finish in conference play and tied Cleveland State for second place in the regular season to advance to the Horizon League Tournament. Because the Vikings edged the Norse in the regular season tiebreaker, the Norse drew the No. 3 seed in the tournament and will face the No. 6 seed Wright State (7-9 HL) in the quarterfinals on Friday, Nov. 16 at 7 p.m.
With a win, the Norse will advance to the semifinals and face Cleveland State on Saturday, Nov. 17 at 6 p.m. The Norse started their weekend play on Friday and recorded a 3-1 victory over the Golden Grizzlies by set scores of 23-25, 25-23, 25-26, 25-9. The Norse held a seven point lead to start the match against the Grizzlies, but the Grizzlies managed to fight back with a 5-0 run, before closing in with four kills in the last five points to finish the game. Haley Libs and Bailey Western led the Norse offense with three kills apiece, while Ashton Terrill led the defense with seven digs. The Grizzlies started hot in the first set, gaining a 17-12 advantage over the Norse midway through. However, the Norse bounced back late with aces from Terrill and Shelby Olsen, as well as blocks from Laura Crawford, Natalie Hardig, and Anna Brinkmann. This led to the Norse tying the game at 23. A kill from Brinkmann brought the Norse up to set point, before a kill from Libs finished the set, 25-23. The Norse gained an early 8-2 advantage to start the third set. This was held throughout the set as the Grizzlies barely got within 10 points of the Norse. The Norse dominated at the net, gaining 16 kills as well as 4 blocks. Three of which came from Hardig and Crawford. Libs earned six of the kills for the Norse and added in two aces. The Norse established a 13-3 lead to start the fourth set and continued that momentum throughout. Western brought the Norse to set point and was finished with a kill from Brinkmann. Libs led the Norse with her twenty-first double-doubles with 14 kills and 10 digs, while Olsen and Wucherer joined Libs in double-doubles with 22 assists/14 digs and 23 assists/10 digs. Crawford joined Libs in double figures with 10 kills and rejected six attacks respectively. The excitement around senior night for Libs and the added stakes of the final game of the regular season made for an energy packed house Saturday night at Regents Hall. Though both teams battled hard, the Norse were able to dig deep and gain a 3-2 victory over the Vikings with set scores of 25-21, 25-27, 26-28, 25-15, 15-9. The Norse started the first set hot, but quickly faded when the Vikings fought back and took the lead, 21-20, forcing the Norse into a timeout. After the timeout, the Norse came back with a 4-1 run to finish the game. Libs led the Norse offensenly with four kills on nine swings and no errors, while Terrill led the Norse defensively with four digs. The second set was evenly matched and highly competitive. The Norse had a slight lead to start the set, but a string of errors let the Vikings take a 20-18 lead over the Norse. The Norse came back to tie the game and push it past set point, before the Vikings gained the advantage and the victory, 27-25 . Defensly, the Norse did exceptionally well and racked up a combined total of 64 digs. The Vikings were up at set point in the third ,before the Norse came back to knot the game at 24. The score was back and forth from there until the Vikings finished the set, 28-26. Libs was close to gaining a double-double in the third set with nine kills and 13 digs, while Brinkmann followed close behind with 11 digs. The Norse came out firing on all cylinders to start the fourth set ahead, 7-2. The Norse would maintain this lead throughout and finish the game, 25-15. The Norse maintained their momentum from the fourth set and established an early 8-4 lead in the deciding fifth set. As the Vikings tried to challenge back, the Norse fought harder at the net with Brinkmann gaining a solo block and a final kill from Libs. Libs recorded her 22nd double-double with 21 kills and a career-high 37 digs. Wucherer posted her fourth triple-double of her career with 10 kills, 34 assists and 12 digs. With Saturday’s game being senior night, the Cleveland State game was her last home game as a Norse.